" ... a major success in its original two-volume collection. Palestine has now finally been released in a new one-volume format, with a new foreword by Edward W. Said"--P.  of cover. Contents: Palestine, a nation occupied. -- Palestine, in the Gaza Strip. Journalism in comics form submitted by eknapp on September 6, 2016, 3:02pm In 1991 the author spent two full months touring the Palestinian territories, conducting something on the order of 200 interviews. In Palestine, he recounts his time there and tells the endlessly tragic stories of his guides, hosts, and interviewees. I recognize the enormity of a journalist describing the Israeli-Palestinian conflict from the Palestinian point of view, and of his using comics as the medium to do so. And he succeeded tremendously in humanizing a people who are typically either forgotten by the media or portrayed uniformly as villains. But man, something about this book made it hard to keep picking it back up. Maus blew me away. Persepolis was amazing. But for some reason Palestine was kind of a slog. Seattle, WA : Fantagraphics Books, 2001. Description: vi, 285 p. : chiefly ill. ; 28 cm. Jewish-Arab relations -- Comic books, strips, etc. Arab-Israeli conflict -- Comic books, strips, etc. 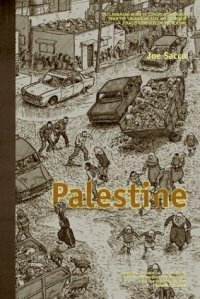 Palestinian Arabs -- Comic books, strips, etc. Gaza Strip -- Race relations -- Comic books, strips, etc. Middle East -- Politics and government -- Comic books, strips, etc. Israel -- Politics and government -- Comic books, strips, etc.